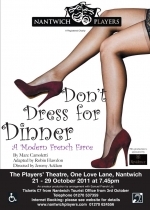 Originally a smash hit in Paris and London, Don't Dress For Dinner is a farcical comedy where the accepted moral code is turned on its head. It is set in the present day, in a country house some distance from Paris. Bernard and his wife, Jacqueline, have converted an old farm building and Bernard is planning to entertain his mistress while Jacqueline visits her mother. He is quickly out-manouevred by his stylish wife and the fun begins! "The Wife, The Mistress and The Caterer - all meet their match".